This rectangular grid measures 3-1/2" X 12-1/2". Featuring easy to read markings on both sides of the ruler, a 45 degree angle line cross at the 1/4" mark. You can create circles up to 22" using the holes drilled in the center. 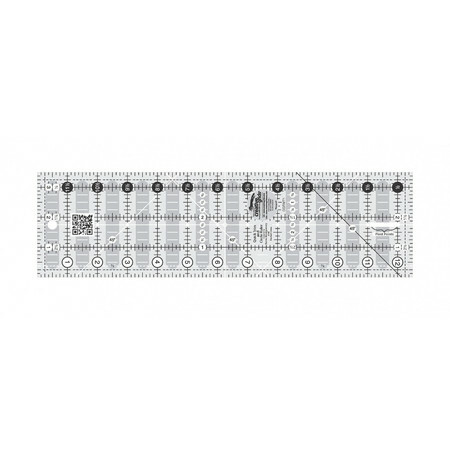 This ruler is perfect for cutting binding and border strips as well as trimming fabric edges. Equipped with Creative Grid's exclusive grip, this ruler slides easily on fabric yet stays in place when pressure is applied. Use the included instructions or scan the QR code to view a video demonstration. Made in the USA. Designed by Rachel Cross & Karen Montgomery.